Wolfram Alpha, the online computational engine, is now available as an iPhone application that serves as a graphing calculator, calorie counter, international economic index, astronomy guide, currency converter, stock information tool, and more -- but portability for that impressive functionality comes with an impressive price of $49.99. ha app an age-restricted rating of 9+ for "infrequent/mild profanity or cruel humor." Assuming the app doesn't return results with swear words that often, I can only guess the cruel humor involved is the app's price. conducted by Mashable and compared their findings with those of the Wolfram Alpha Website. I found the Web version could do everything the app could, including mortgage calculations, stock analysis, and solving complex mathematical problems. 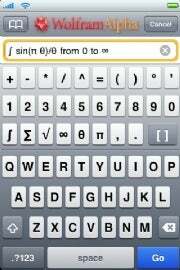 The application is by necessity a bit compressed on the iPhone; when you start enter a query, the app displays the familiar Wolfram Alpha search bar, but two keyboards stacked on top of each other take up most of the screen. The two keyboards make it easier to enter complex mathematical formulas; the top keyboard has numbers and symbols, while the bottom one is a regular QWERTY keyboard. After you enter your query, the app spits out the same answers to the same questions you could put to the computational engine's Website. You also need an Internet connection via the iPhone's Wi-Fi or 3G capabilities for the app to work, same as the Website. So if the app offers the same functionality as the Website (which is also accessible as a Firefox add-on), why the $50 price tag? You need an Internet connection to use it, so why not access the Web version for free instead of buying the app? It may be easier to enter queries and problems using the app's double keyboard, but does that warrant such a big price tag? One of the app's main advantages is as a replacement for graphing calculators, which can cost upward of $100; however, it should be noted that regular graphing calculators don't need a Wi-Fi connection to work. Also, if you type "graphing calculator" into iTunes you get results for 27 iPhone apps, ranging in price from zero to $10. 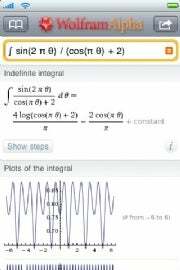 Sure, the Wolfram Alpha app is more than just a calculator, but from what I can tell so is its Website.